We no longer live in a world that is speared by race, color, creed, religion, borders. We now live in one ever-vast beautiful shrinking digital age, where the only thing that differentiates us is our fingerprint, our individuality, our DNA. DNA 11, the company that brought DNA Art to the masses, is going back in history for its latest art from life masterpiece – the DNA Ancestry Portrait. Premiering on Thursday at the opening of the WIRED Store in New York, DNA Ancestry Portraits combine the science of genealogy with the technology of the mobile and social web to create a new form of augmented art. World-renowned designer and futurist, Karim Rashid, whom TIME Magazine declared the "Most Famous Industrial Designer in All the Americas", was the first to encode his maternal ancestry in a DNA 11 Ancestry Portrait. Karim recognizes the artistic value and scientific significance of this augmented art. DNA Ancestry Portraits begin with a sample of your DNA which is then sequenced to determine your mtDNA haplogroup, essentially your maternal lineage dating back thousands of years to the original homosapiens in Africa. Your sequenced DNA, visualized as a sequence of letters and numbers representing gene mutations from a reference sample, is then combined with your unique ID number to create a personal website address that is programmed into a QR Code generator. Your DNA Ancestry Portrait is then created using your choice of several color palettes creating a gateway from the physical art piece to the secrets of your ancestry it is created from. Upon scanning the augmented art piece with a compatible smartphone your personal genetic history is decoded and you are led to a unique ancestry web page where the details of your maternal lineage are unveiled. Co-founder Adrian Salamunovic is proud to take DNA Art to the next level with DNA Ancestry Portraits and once again take the lead the industry. DNA Ancestry Portraits will be available for sale on Tuesday, November 16 in 25 colors combinations and three sizes starting at $440 USD at http://www.dna11.com. For those who prefer DNA 11’s original DNA Portrait, a DNA Ancestry “barcode” Signature can be added to their art piece for only $199. In addition, customers who already possess mtDNA or Y-chromosome tests from genetic testing vendors such as 23andMe, Navigenics, Ancestry.com, Family Tree DNA, deCODEme or National Geographic: The Genographic Project may use their results to create a DNA Ancestry Portrait of their own. Nazim Ahmed, DNA 11 co-founder, is excited by the opportunity this new type of art presents to illustrate both how we are all unique and how we are all the same. “While a photograph focuses on our exterior differences, DNA 11 Portraits remind us of the one element that we all share in common – our DNA," said Mr. Ahmed. “DNA 11 Ancestry Portraits continue to merge the worlds of art and genomics in a unique and thought-provoking way. As science continues to unravel the very code of our existence – our DNA – we are able to visually capture this historical milestone through our DNA Ancestry Portraits." DNA Ancestry Portraits are the ultimate intersection of art, science and technology that once again position DNA 11 as the industry leaders in art from life. The WIRED Store is not just a shopping destination – it’s an interactive experience that allows you to touch, test and tinker with the most “wired” products out there for the digital gentleman, gadget girl, gastronaut, smarter upstarter, adventure capitalist, maker, or culturazzo in your life. Stop by to shop and share what you find with friends and family. The WIRED Store is located at 692 Broadway in New York City or online at http://www.wiredstore.net. Karim Rashid is one of the most prolific designers of his generation. Over 3000 designs in production, over 300 awards and working in over 35 countries attest to Karim's legend of design. His award winning designs include democratic objects such as the ubiquitous Garbo waste can and Oh Chair for Umbra, interiors such as the Morimoto restaurant, Philadelphia and Semiramis hotel, Athens and exhibitions for Deutsche Bank and Audi. Karim has collaborated with clients to create democratic design for Method and Dirt Devil, furniture for Artemide and Magis, brand identity for Citibank and Hyundai, high tech products for LaCie and Samsung, and luxury goods for Veuve Clicquot and Swarovski, to name a few. Karim's work is featured in 20 permanent collections and he exhibits art in galleries worldwide. Karim is a perennial winner of the Red Dot award, Chicago Athenaeum Good Design award, I.D. Magazine Annual Design Review, IDSA Industrial Design Excellence award. DNA 11 is the original creator of DNA Art – the world's most personal form of art that combines design, technology, science and pop culture. DNA 11 creates contemporary custom portraits from DNA, fingerprints and lip prints. 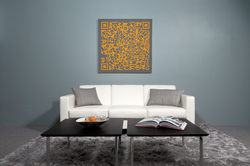 Each modern art piece is as unique as the person purchasing it. These one-of-a-kind art pieces can be found in the Museum of Modern Art (MoMA) stores, have been featured in an episode of CSI: New York and can be found in thousands of homes around the globe. Most recently, DNA 11 changed the industry again with the launch of DNA 11 Ancestry Portrait which visualizes maternal lineage in a custom piece of augmented art. For more information visit http://www.dna11.com. Follow DNA 11 on Facebook at http://www.facebook.com/dnaart and on Twitter at http://www.twitter.com/dna11.